IBM® InfoSphere® Master Data Management Reference Data Management Hub (InfoSphere MDM Ref DM Hub) is designed as a ready-to-run application that provides the governance, process, security, and audit control for managing reference data as an enterprise standard, resulting in fewer errors, reduced business risk and cost savings. 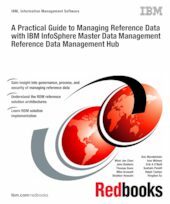 This IBM Redbooks® publication describes where InfoSphere MDM Ref DM Hub fits into information management reference architecture. It explains the end-to-end process of an InfoSphere MDM Ref DM Hub implementation including the considerations of planning a reference data management project, requirements gathering and analysis, model design in detail, and integration considerations and scenarios. It then shows implementation examples and the ongoing administration tasks.